I love Alesha, I run a budget Alesha deck. 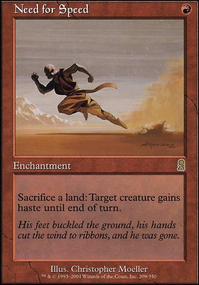 Just a few notes I'd like to share from my experience: Ankle Shanker doesn't work in combination with Alesha's ability, due to trigger timing, so you have to count on getting Ankle Shanker 's ability to trigger the turn after you resurrect him (the same would technically be true with Mardu Strike Leader ). If you want to run tokens as a sub-theme, I recommend Ponyback Brigade and Noosegraf Mob , since you can resurrect both with Alesha and their abilities trigger when they enter the battlefield. Flame-Kin Zealot also benefits you for going wide with lots of tokens. And if you want Alesha's ability to work without her dying all the time, whether due to blockers or removal, make sure to give her some [email protected]$$ gear: I run Cloak and Dagger , Swiftfoot Boots , Whispersilk Cloak , and Sunforger . Oh, and Hero's Blade , which I think is greedy but she has first strike, so it's pretty good. I think those will work better for you than the auras, especially since they cost colorless mana and allow you a little more flexibility. 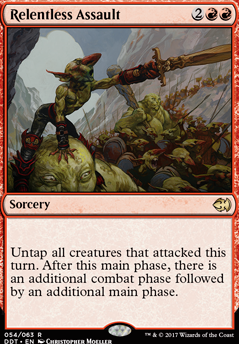 Relentless Assault would be a fun sorcery for you to run with all your tokens. 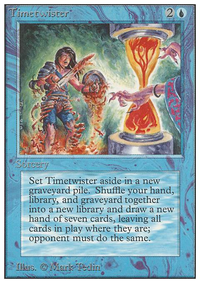 As you play this, you may find that you need more card draw & more creatures in your graveyard for Alesha to resurrect for you, so I would be remiss to not mention Faithless Looting , Wild Guess , and Tormenting Voice ( Cathartic Reunion and Dangerous Wager also works). Put your expensive creatures with 2 power from your hand into your graveyard so that they only cost 2 mana to put onto the battlefield when you trigger Alesha. 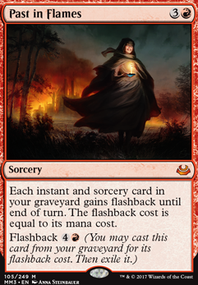 So Noosegraf Mob and Ponyback Brigade become instead of their normal mana costs, which is such a bargain. Have fun! Alesha is amazing. There are a lot of creatures you can cut but the first thing you may want to consider is artifacts. I know you want to build an instant heavy deck but you may want some artifacts that will give narset a consistent boost once they're equipped. Darksteel Plate . Trailblazer's Boots , Swiftfoot Boots , Helm of the Host , Grappling Hook , Sword of Feast and Famine . You also want a ,to of artifact ramp for your deck. 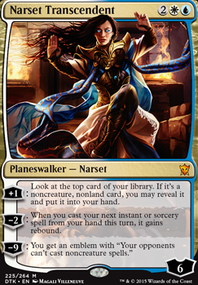 Narset of often seen as a major threat, you want to get her out as fast as possible. Sol Ring , the signets, Commander's Sphere , Darksteel Ingot , MindStone, Gilded Lotus are all great for that. 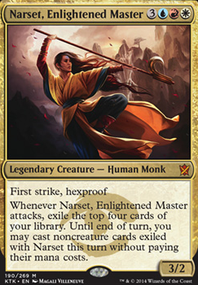 If you really want to run creatures in narset, I'd stick to about your 10 favorite, just so you have a lower chance of exiling them with her ability. I would keep mirrorwing, zada, dragonlord, etali, jace, thing, sphinx, kiega, exemplars and sage. Moving onto instants and sorceries, you are going to want some extra combat phases along with double strike and pump affects. Fury of the Horde , Waves of Aggression , Savage Beating , Relentless Assault , World at War , Seize the Day . Id keep your instant count down around 30 cards total, start cutting with things like Gideon's Reproach , that are very situational. Thrumming Stone is an absolute staple in Relentless Rats decks. For more rats, I would consider Burglar Rat , Ink-Eyes, Servant of Oni , Throat Slitter , Pack Rat , and Taurean Mauler . As for general tribal stuff, Shared Animosity , Vanquisher's Banner , Cover of Darkness , Aphetto Dredging , Patriarch's Bidding , Kindred Dominance , Kindred Charge are all good considerations. Extra combat steps could also be helpful. Seize the Day , Relentless Assault , and World at War are the most affordable options, I believe. For recursion, you could do Balthor the Defiled , Patriarch's Bidding , Garna, the Bloodflame , No Rest for the Wicked , and Underworld Cerberus . You should totally add extra combat step cards because it will allow stonebrow to trigger multiple times in a single turn! Breath of Fury , Combat Celebrant , Relentless Assault , World at War , Hellkite Charger . I have had a quick look at your deck and can see that you are trying to go wide with lots of creatures, and utitlise the power of cards like Goblin Bushwhacker, Hellion Eruption, might of masses and Outnumber so i will stick with this theme of the deck and make some suggestions based on this assumption. 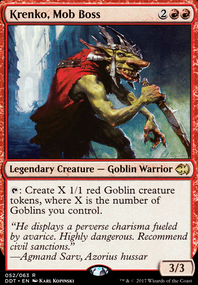 Firstly I would change Runaway Steam-Kin as this card is only really good in a mono red deck looking to play small spells, your deck is currently 33% green and 67% red, and although this is a large amount of red, you dont have enough low cost red spells to make this a great card, we can find something better :). 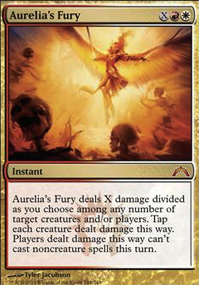 If you decide to go mono red down the line, then this is a potential card to bring back. A lot of your deck seems to be about generating a huge amount of eldrazi spawn's, so with this in mind I would up the Broodwarden to 4, as this will really help finding one, and multiple of these is even better! To make sure you can cast your 5/6 mana spells we would need to up the land count to 24/25 or have more ways to create mana if you take my advice to remove the Runaway Steam-Kin's. Instead of adding extra lands, I see you already have Growth Spasm, so I would suggest putting 2 more in as well to make sure you hit lands consistently, but still allows you to develop your board. (You wont want to sacrifice too many eldrazi spawns for mana). Lastly I would try and make room for 2 more Outnumber and 1 more Lightning Bolt as these are both key removal for your deck. I would drop x1 Relentless Assault and x2 Emrakul's Hatcher to make room for this, as both these cards require a lot of mana to cast. Relentless assault is also a card you dont want to ever have 2 of, and with other win-cons in your deck, I feel that dropping one still should mean you see it in 30-50% of games and gives you the option of double combat if needed. I hope the above is taken as suggestions based on my experience of the game and the cards you have chosen currently and isnt meant as a definitive guide. If you need any additional information on my selections or want to know my opinion on other cards, i'd be happy to help. Relentless Assault seems like it could have a place in here. From first look some cards you might want to take out are: Battlegrace Angel, Dawnglare Invoker, Orim's Thunder, Seer's Sundial, Staff of Nin, Curse of the Nightly Hunt, Faith's Fetters, Warstorm Surge. I know you dont want to spend that much money on this deck but here are some quick cards that you might want to add: Sower of Discord, Steel Hellkite, Bloodgift Demon, Lightning Greaves, Swiftfoot Boots, Swords to Plowshares, Angelic Arbiter, Indulgent Tormentor, Utter End, Terminate, Chaos Warp, Unmake, Cataclysm, Quicksilver Amulet, Strionic Resonator, Blood Speaker, Rune-Scarred Demon, Sarkhan's Triumph, Armageddon, Bontu's Last Reckoning, Crux of Fate, Day of Judgment, Fumigate, Exotic Orchard, Battlefield Forge, Caves of Koilos, Relentless Assault, Angelic Skirmisher, Harvester of Souls, Rogue's Passage. I think some of these cards are better options then what you have right now. goblinguiderevealpls on Etali EDH: good, bad, terrible?